We are an office cleaning company in Wandsworth SW18 that puts clients first and whose priority is to achieve customers’ cleaning goals when it comes to office hygiene. Every work space has to be clean and healthy for visitors’ sake. 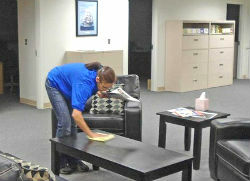 We are number one in office cleaning and we take pride in our agency, which has been in business for many years. We have a wonderful team of qualified technicians who work with desire. We offer affordable rates and extended working hours. We are very thrilled to help business owners and managers. If you need our service, let us know by phone. We are here for you. Our prices vary from cleaning to cleaning. When determining your price, we will take into consideration a few factors like how big your office, how many facilities and frequency of visits. Once we discuss this in more detail, you will be given a price quote and you can get things started. Our cleaning system is revolutionary. We use the latest cleaning products and effective cleaning methods. All our staff is trained on the best cleaning practices, plus they have extensive experience in this trade. They are motivated, meticulous and skilled. We guarantee they will leave your office immaculate. Our customer support representatives play an active role in our office cleaning company in Wandsworth SW18. They are the ones that communicate with our clients, schedule appointments, answer questions and provide price estimates. They are the ones that will help create an individual cleaning plan for your office that fully corresponds to your needs and requirements. You can ask our representatives about anything correlated with our service. They are very responsive. The best thing is, they are available 24 hours a day, 7 days a week. Do not be afraid to call them at night if you want. Your call will be answered. We are waiting for you.